Emman Buquid was born on December 31, 1999 as Emmanuel A. Buquid. Andrew Byrne was born on December 30, 1999. He is an actor, known for Jekyll (2007), After Thomas (2006) and Cranford (2007). Anastasiya Dobrynina was born on December 30, 1999 in Moscow, Russia. She is an actress, known for Kuka (2007), Tungusskiy meteorit (2010) and Gogol. Blizhayshiy (2011). Born in Florida, Morgan began her acting career at the age of eight. Morgan continued being cast in films, TV, commercials, live performances, stand up, Improv, vocals, theatre and print work. In addition to her acting career, she's a talented singer and writer. Thomaz Veloso was born on December 28, 1999 in Rio de Janeiro, Rio de Janeiro, Brazil. He is an actor, known for Belíssima (2005), Casos e Acasos (2007) and The Prophet (2006). Toke Lars Bjarke is son of actor Lars Bjarke and environmentalist Tanja Aertebjerg. He grew up in central Copenhagen, Denmark, but the family spent two years in London in his early upbringing, and he is fluently in English as well as Danish. George Whitford was born on December 23, 1999 as George Edward Whitford. He is an actor, known for Savannah (2013) and Ellen: The Ellen DeGeneres Show (2003). Yuria Nara was born on December 21, 1999 in Osaka, Japan. She is known for her work on Ponyo (2008) and Tamagotchi! (2009). Jeremy Vance was born on December 21, 1999 in Fullerton, California, USA. He is an actor, known for The Paper Prince (2011). Shane Stephenson was born on December 19, 1999 in San Diego, California, USA. He is an actor, known for The Hypocritic Oath (2009), Never Better (2008) and South Park (1997). Tyron Ansuhenne was born on December 18, 1999 in Hamburg, Germany. He is an actor, known for Hier kommt Lola (2010). Bryce Robinson was born on December 16, 1999 in Albuquerque, New Mexico, USA. He is an actor, known for The Switch (2010), Four Christmases (2008) and Valentine's Day (2010). Rylie Behr was born on December 16, 1999 in Mason City, Iowa, USA as Rylie Jo Behr. She is an actress, known for Chasing Gold (2016), I Heart Shakey (2012) and Nanuq (2011). Chase A. Fox was born on December 15, 1999 as Chase Alexander Fox. He is an actor, known for The Incredible Voyage of Captain Hook (2010), The Night Shift (2014) and Easy Money (2008). Bea Atienza was born on December 12, 1999 as Maria Josefina Beatriz I. Atienza. Callum McManis was born on December 11, 1999 in Sydney, New South Wales, Australia. He is an actor and director, known for Fade (2015), The Centre (2015) and The Immortal. Christopher Li was born on December 11, 1999 in Burbank, California, USA. He is an actor, known for Saved (2006), Comedy Gumbo (2008) and My Dad Is Better Than Your Dad (2008). Sergej Sarcevski was born on December 10, 1999 in Skopje, Macedonia. He is a director and cinematographer, known for He She It (2015), A Stolen Smile (2014) and Bottle (2013). James Mordaunt was born on December 9, 1999. He is an actor, known for Venus in Eros (2012), The Hour of Power (1970) and Songs of Praise (1961). Wyatt Entrekin was born on December 7, 1999 in Memphis, Tennessee, USA as Wyatt Matthew Entrekin. He is an actor, known for Walk the Line (2005). Cymfenee was born on December 7, 1999 in Los Angeles, California, USA as Cymfenee Dean-Phifer. She is an actress, known for Wild Hogs (2007). Diego Miró was born on December 6, 1999. He is an actor, known for Now You See Me (2013) and Bless Me, Ultima (2013). Jillian Bruno was born on December 6, 1999 in Los Angeles, California, USA. She is an actress, known for Unthinkable (2010), Dexter (2006) and Little Girl Lost: The Delimar Vera Story (2008). Nathan Morrow was born on December 4, 1999 in Torrance, California, USA as Nathaniel Patrick Austin. He is an actor, known for Keeping Up with the Kardashians (2007). Macauley Keeper was born on December 1, 1999. He is an actor, known for The Missing (2014), Vexed (2010) and Little Crackers (2010). Jaden Sorensen was born on November 30, 1999. He is an actor, known for Must Love Dogs (2005), Grey's Anatomy (2005) and Without a Trace (2002). Joshua Bolten was born on November 30, 1999 in Munich, Germany. He is an actor, known for Under Suspicion (2002), Kommissarin Lucas (2003) and Siska (1998). Tamir Hald Levi was born on November 30, 1999 in Afula, Israel. He is an actor, known for To Mod En (2012). Pavle Bozic was born on November 29, 1999 in Belgrade, Serbia. He is known for his work on Upside Down (2007) and The Parade (2011). Nikola Bundalo was born on November 29, 1999 in Banja Luka, Bosnia and Herzegovina. He is an actor, known for Zamalo zivot (2013). Nyla Crawford Noel was born on November 28, 1999 in Ontario, Canada. She is an actress, known for Soul Food (2000). Taliesin Jacobs was born on November 20, 1999 in Los Angeles, California, USA. He is an actor, known for Lost Angelas (2019) and Hey DJ (2003). Denisse Peña was born on November 19, 1999 in Madrid, Madrid, Spain as Denisse Peña Molina. She is an actress, known for Servir y proteger (2017), The Boarding School (2007) and No culpes al karma de lo que te pasa por gilipollas (2016). Ida Février was born on November 17, 1999 in Paris. She is an actress, known for Jacky in the Kingdom of Women (2014). Francesca Scorsese was born on November 16, 1999. She is known for her work on The Departed (2006), Hugo (2011) and The Aviator (2004). Kilian Schüler was born on November 16, 1999. He is an actor, known for Das Traumschiff (1981), Selbstgespräche (2008) and Alarm für Cobra 11 - Die Autobahnpolizei (1996). Joshua Davis was born on November 13, 1999 in Louisiana, USA. He is an actor, known for Who Do You Love (2008). Georgia-Taylor Woods was born on November 10, 1999. She is an actress, known for The Tribe (1999). Sequoyah Adams-Rice was born on November 9, 1999 in Albuquerque, New Mexico, USA. He is an actor, known for Everett Ruess Wilderness Song (2013), Agnes Day (2009) and Milagros (2008). Octavio Ocaña was born on November 7, 1999 in Villahermosa, Tabasco, Mexico. He is an actor, known for Vecinos (2005), XHDRbZ (2002) and Hermanos y detectives (2009). Gino Yang was born on November 7, 1999 as Gerardo Angel M. Yang. Meadow Walker was born on November 4, 1999 in Northern California, USA as Meadow Rain Walker. Niko Baur was born on November 3, 1999. He is an actor and director, known for The Sound of Silence (2015), CSI: Crime Scene Investigation (2000) and Parenthood (2010). Klevis Doga was born on October 27, 1999 in Toronto, Ontario, Canada. He is an actor, known for Being American (2014), A Matter of Justice (2011) and The Architect (2012). Allegra Leguizamo was born on October 23, 1999 in Manhattan, New York City, New York, USA as Allegra Sky Leguizamo. She is an actress, known for Ice Age: Dawn of the Dinosaurs (2009), Ice Age: Continental Drift (2012) and Lockdown (2019). Rita Constantino was born on October 22, 1999 in Portugal. She is an actress, known for Julgamento (2007), Água de Mar (2014) and Laços de Sangue (2010). Michael Samek was born on October 20, 1999 in Traiskirchen, Austria. Kelly Couckuyt was born on October 19, 1999 in Québec, Canada. She is an actress, known for Binnenstebuiten (2013). Kendall Hancock was born on October 15, 1999 in Alabama, USA as Kendall Diane Hancock. She is an actress, known for I Stand Here Ironing (2005). Miko Manzano was born on October 12, 1999 as Mikkel Gabriel D. Manzano. Creed Coley was born on October 11, 1999 in Grand Junction, Colorado, USA. He is an actor, known for Opposite Day (2009) and Summer of the Cicada (2009). Adam Denomme was born on October 11, 1999 in Phoenix, Arizona, USA. He is an actor, known for References (2010) and At Best Derivative (2010). 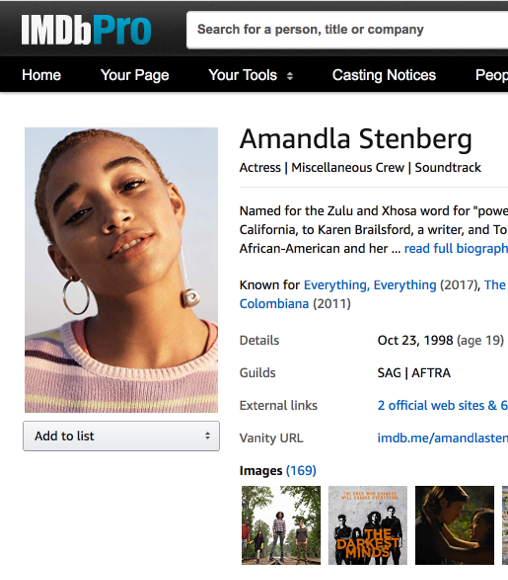 Amanda Tuffin was born on October 7, 1999 in Miami Beach, Florida, USA. She is an actress, known for 2001 Maniacs (2005) and 2001 Maniacs: Field of Screams (2010). Holden Thomas Maynard was born on October 6, 1999 in Atlanta, Georgia, USA. He is known for his work on Baby Blues (2008), Clint Eastwood (2009) and We Deserve the Right! (2011). Joseph Newman was born on October 6, 1999 in Nashville, Tennessee, USA. He is an actor, known for Relapse (2008), Beyond Invention (2004) and Relapse: Behind the Scenes (2008). She donated many toys to Rocky Stone to be given to less fortunate kids as part of the Toy Mountain Campaign 2004. Kyle comes from a family of distinguished visual artists. His grandfather and uncles are well-known in the fields of painting and sculpture. He manifests the artistic gene through his cooking and specially, his plating and food presentation. Joseph Furnace was born on October 4, 1999 in Chester, England. He is an actor, known for Shameless (2004). Hannah Gosselin was born on October 4, 1999 in Detroit, Michigan, USA as Hannah Catherine Gosselin. She is an actress, known for Imagination (2010) and Flesh (2011). Damien Gelot was born on October 2, 1999. He is an actor, known for Le cri (2006). Jeremias Meyer was born on September 30, 1999 in Munich, Germany. He is an actor, known for Vampire Sisters (2012), Inga Lindström (2004) and Vampire Sisters 2: Bats in the Belly (2014). Juan Urdangarín Borbón was born on September 29, 1999 in Barcelona, Spain as Juan Valentín Urdangarín Borbón. Jenna Craig was born on September 28, 1999. She is an actress, known for Green Lantern (2011), Quantum Apocalypse (2010) and The Waiter (2010). Devin Barrett was born on September 28, 1999 in Valencia, California, USA. He is an actor, known for Decisions (2011), A Tear (2010) and Edgar Floats (2010). Martim Varela was born on September 28, 1999 in Lisbon, Portugal. He is an actor, known for Call Girl (2007). Anfisa Vistingauzen was born on September 27, 1999 in Moscow, Russia as Anfisa Vladimirovna Vistingauzen. She is an actress, known for Metro (2013), Ostrov (2016) and Kompensatsiya (2010). Dmitriy Dedyushko was born on September 21, 1999 as Dmitry Aleksandrovich Dedyushko. He was an actor, known for Vechernyaya skazka (2007) and Realnyy papa (2008). He died on November 3, 2007 in Petushki, Vladimirskaya oblast, Russia. Tj Burnett was born on September 19, 1999 in Oceanside, California, USA. He is an actor, known for The Kingdom (2007), Dollhouse (2009) and Girlfriends (2000). Tamino Wecker was born on September 15, 1999 in Munich, Bavaria, Germany as Tamino Gabriel Wecker. He is an actor, known for Friedliche Zeiten (2008), When Santa Fell to Earth (2011) and Kommissarin Lucas (2003). Cameron Ten Napel was born on September 14, 1999 in Arlington, Texas, USA. She is an actress, known for A Christmas Snow (2010), Cool Dog (2010) and Pink (2007). Wyatt Ross was born on September 14, 1999 in Hackensack, New Jersey, USA. He is an actor, known for Life on the Ledge (2005) and The Amazing Wizard of Paws (2015). Lilly Van Der Meer was born on September 12, 1999 in Gold Coast, Queensland, Australia. She is an actress, known for Neighbours (1985), Neighbours: Xanthe Hearts Ben (2016) and Neighbours: Summer Stories (2016). Clara Conzen was born on September 12, 1999. She is an actress, known for The Murder Farm (2009), Das Baby (2007) and Die Liebe kommt mit dem Christkind (2010). Jett Good was born on September 11, 1999. He is an actor, known for Spy Kids 4-D: All the Time in the World (2011). Savannah Ruelas was born on September 11, 1999 in Santa Barbara, California, USA. She is known for her work on Young Folks (2007), Destination EB (2017) and EpiKurious Kids (2012).